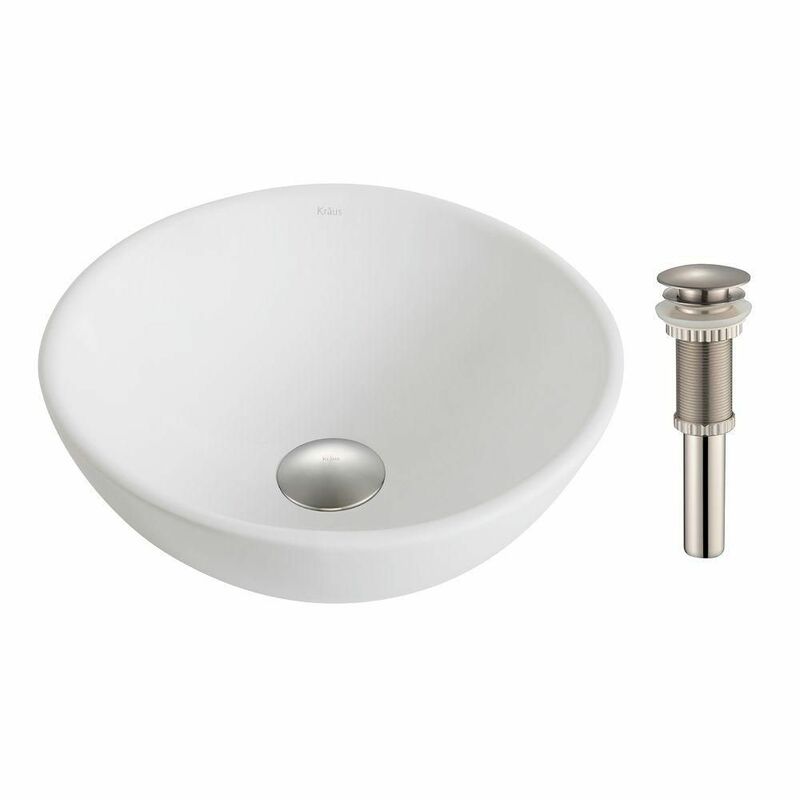 Spruce up the look of your bathroom with this fine-crafted, efficient sink from Kraus. Thanks to its sturdy ceramic construction, this sink will maintain is stylish appearance through all kinds of everyday wear and tear. Next time you take on a home renovation project, make sure to choose this top-notch sink. This elegant sink from Kraus combines top-notch style and efficiency to elevate the look of any bathroom. It's been designed with ultra-durable ceramic, capable of keeping its beautiful appearance even after years of wear and tear. Next time you take on a home renovation project, make sure to choose this top-notch sink. This elegant sink from Kraus combines top-notch style and efficiency to elevate the look of any bathroom. Constructed out of sturdy ceramic, it maintains a stylish look through all kinds of everyday wear and tear. Clean up in style with this top-of-the-line sink, perfect for a wide variety of bathroom designs. ElavoWhite 13.70-inch x 5.50-inch x 13.70-inch Circular Ceramic Bathroom Sink with Drain Stylish and extra durable by design, this vessel sink from Kraus is sure to be a staple of your bathroom remodel. You'll be impressed at how well its stylish ceramic design holds up against everyday wear and tear. When it comes to improving the overall look and utility of your bathroom, this sink is a top-grade choice. ElavoWhite 13.70-inch x 5.50-inch x 13.70-inch Circular Ceramic Bathroom Sink with Drain is rated 5.0 out of 5 by 10. Rated 5 out of 5 by Lee from My husband installed this easily. It is a good size for a small space. I like the look. It functi... My husband installed this easily. It is a good size for a small space. I like the look. It functions well. No problems yet. Rated 5 out of 5 by HomeDepotCustomer from Well made and solid.... Well made and solid. Rated 5 out of 5 by TLF414 from The sink is perfect. I loved the smaller size, as... The sink is perfect. I loved the smaller size, as the standard size options were overwhelming for my vanity. Also, the drain that was included is great. It looks sharp and drains well. Rated 5 out of 5 by Nickname123 from After buying a cheaper version on Amazon and having to... After buying a cheaper version on Amazon and having to return it for poor quality, this sink and drain fit perfectly and is much better made! Don’t settle on cheaper…. It cost us almost the same amount to return the cheaper version to Amazon as it did to buy it! Expensive lesson!